Angelica Elizabeth Zambrano Mora, aged 18 from Ecuador wrote Prepare to Meet Your God and in it, she talks about being dead for 23 hours and finding herself in hell among many celebrities that include Michael Jackson the singer and Pope John Paul II. The woman said that the Lord had told her that there were many famous people in Hell and many who had known about the Lord and he had said that he was going to show her another part of the furnace. She went on to describe a place and seeing a woman surrounded by flames and she was tormented and begging for mercy from the Lord. The woman said how the Lord had signaled the woman with his hand and said to her you see that woman there in the flames, it is Selena. They then walked closer to the woman and she was shouting and screaming to be shown mercy and to be taken out of the place. The Lord was said to have looked at the woman and said that it was too late to repent. Mora then said that the woman asked her to go and tell the whole of humanity about what she had seen and tell them not to venture to that place, she said that Mora should tell people not to listen to the songs the woman had sung or sing any of her songs. Mora then asked the woman why and was given the reply that every time people listen to or sing her songs she was tormented even more. She also said that people who listen to the songs she recorded when she was alive would be coming to the same place. Mora then said that she had looked far away and that she had seen many demons, all of which had been spilling out what looked to be rain. She asked the Lord what it was that she was seeing and he said that it was people in flames and they were shouting to help them. The demons were said to be laughing and their flames kept increasing. Mora went on to say that there was brimstone and this helped to multiply the flames along with increasing the anguish of the people and this made the demons laugh even more. The Lord told Mora that it was the wages of people who had not repented. She went on to say that the Lord had taken her to a place where there was a man who was very well known. Mora said that she had lived a life of a young Christian girl and had the belief that when people died they went to heaven, but that she had found out she was wrong. After the death of Pope John Paul II she was told that he was now in heaven and he was resting in peace with the angels. However, she reported that she had seen him in hell and he was being tormented as he had not repented. Mora said that she had asked the Lord why he was there and the Lord said that while he used to preach to many people, he did not speak the truth and he preferred money to preaching about salvation. The Lord said that the Pope had refused to believe that hell was real and now he found out that it does. Mora then said that the Lord had shown her a big screen that showed the life of Pope John Paul II and the Lord said that there were many idolaters in the place. She went on to say that while she was talking she saw a great deal of money and the pope had so much of it. The Lord then told her to tell humanity about what she had seen and told them that it was time for them to turn to him. The Lord then showed Mora a tunnel and there were lots of people walking through it all with chains on their feet and hands. They were also carrying loads on their backs and the Lord told her that the people did not know him yet. Mora then noticed that some of her family members were in the line and the Lord told her to go and tell them that they were walking to hell. He said that he had chosen Mora to be the watchman, so she had, to tell the truth. 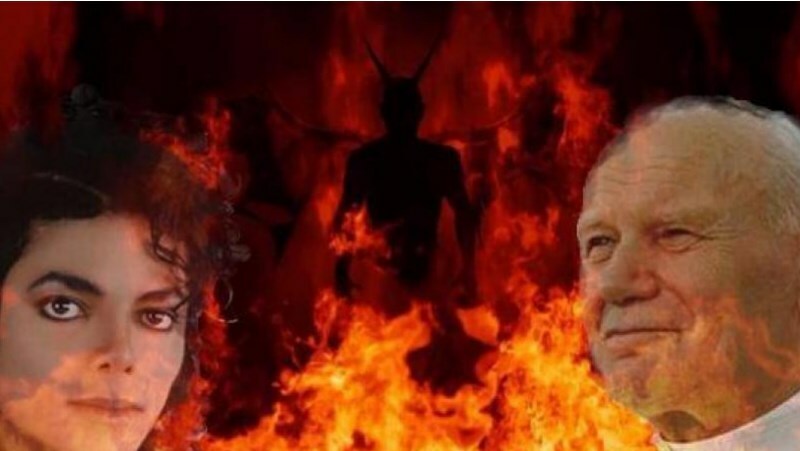 The Lord then said that many famous and very important people were coming to hell and one of them was a man that had been known around the world and that in actual fact he was a Satanist. This man was said to be Michael Jackson. The Lord said that he had made agreements with the devil so that he could have fame and fans. The Lord said that the dances that Jackson was known for were the way demons walk when they are tormenting the people in hell. Mora insisted that the Lord had shown her Michael Jackson and he was being tormented in the flames. The Lord said that people should not play his songs and sing them. Mora said that the Lord had told her that she should go and tell people that he was waiting for them and that they should surrender to him and he would provide them with rest. He then showed her a tunnel into which many thousands of people were dropping into an abyss and souls were falling at a rapid pace. The Lord told Mora that that was how humanity perishes and he cried.